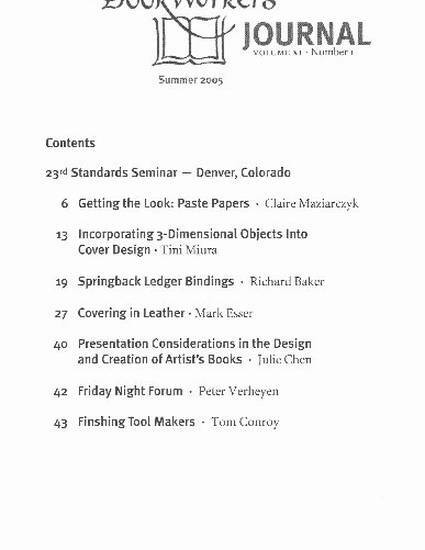 During his introduction, Richard Baker described how, while Deputy Head of the Conservation Bindery of the Johns Hopkins University Library'he was introduced to the springback binding. The historical development of the springback, originally patented in Great Britain in 1799 by John and Joseph Williams, is described in Bernard Middleton's History of English Craft Bookbinding, but Middleton does not detail the steps required to complete a binding. The springbackalso has a long history in the German binding tradition, where it continues to see regular use, especially for guestbooks. As a style, the springback is firmly rooted in the "trade" binding tradition. The springback's robustness and ability to lie fiat and open for extended periods of time without stressing the spine unduly make the structure ideal for use as account and record books. These same qualities also make it suitable for guestbooks, lectern Bibles, and similarly used books. The structure has not see much use on fine bindings or in contemporary book art, regrettably so, especially as the structure would be a suitable platform for many elements of design bindings. Its thick boards would provide a canvas for more sculptural or inset designs. With some minor modification it could also serve as a means of presenting pop-up constructions.